the illusion that it has taken place. Ask any team what they need to improve most and they are like to say “Communications!” And they are right. Any team that communicates well has the foundational tools to respond well to stress, conflict, changes and to have a positive mood. So there’s a lot in it for you as a team leader or team member to improve team communications. Fortunately, this can be done! Remember all those phrases like an ounce of prevention is worth a pound of cure, or a stitch in time saves nine! Apply this tested savvy to teams and you know it’s time to improve how you speak and listen to one another. This is one of the seven skills in the Team Emotional and Social Intelligence Survey® (TESI®), described in our book The Emotionally Intelligent Team. Yet if communication is so important why is it often such a failure? Frankly, it’s not a complex answer. The skills needed have not been taught, fostered and insisted upon; mediocrity is too often accepted. Let’s start with noting the key parts to good communication. Communication is how people interact with each other so they can satisfy their needs and desires to make life better. To communicate, one person (the sender) must transmit information to someone else (the receiver). This message can go to the whole team or to one person, but there has to be an exchange of a message or there is no communication. For example, if a team member speaks about an issue, and another team member later believes he or she never heard of the topic, communication did not occur. For effective communication to occur, the sender’s meaning must also be clearly understood by the receiver. Meaning is conveyed by both verbal and nonverbal communication. If the sender’s words are encouraging but he or she is looking down when speaking, the message and meaning are mixed. Nonverbal communication is likely to convey more of the truth, so it is important that the sender’s verbal and nonverbal messages are congruent in order for the meaning to be accurately understood. All communication has meaning, from the trivial – “Please post a notice of our meeting” – to that of huge consequence – “The building is on fire!” The feeling component adds even more depth to the meaning. Finally, technique is critical for effective communication. Without the awareness and implementation of effective techniques, the message, meaning, and feeling in the communication is lost. The following exercises will help build team communication. We have provided many tips and exercises for working with team communications in our Team Emotional and Social Intelligence Facilitator’s Guide – TESI® Short. This is an important area for us to strengthen together. So send us an email at mhughes@cgrowth.com or comment here on our blog! We are often asked to work with leaders, staff and organizations to guide them in improving their conflict resolution and communications skills. It is an honor to have this opportunity, one we don’t take lightly. Our intention is to facilitate a transformative process that results in sustainable behavior change. Reaching that long term goal requires investment by the individual, team or organization and the coach/facilitator. Success is built through following our four step process to improving conflict resolution skills. If sustainable change is desired, none of these steps can be missed and the dimensions of understanding, commitment, practice and feedback must be interwoven throughout the engagement. The first step is making the decision to seek coaching and facilitation to help an individual or team to improve their conflict resolution and communication skills. You’ve heard the maxim that a stitch in time saves nine. However, it’s likely that by the time this decision is made there’s considerable challenge. Nevertheless, build these skills as soon as possible, the earlier you can intervene the better, even if you only save four stitches instead of nine. At the beginning we normally ask the participant(s) to take one or two assessments, the EQi for individuals and teams will take the TESI or both the EQi and the TESI. All individual responses are confidential and used only to support development. This allows the participants and the coach to have data on the current state of skills and competencies and to highlight both areas that need to be improved as well as existing strengths that can facilitate the change process. 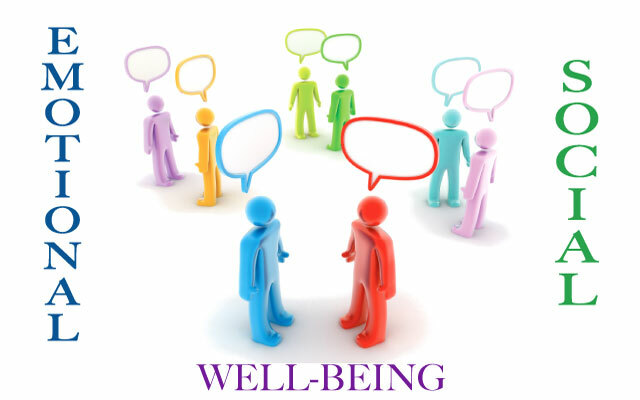 The EQi2.0® reflects one’s overall well-being and ability to succeed in life. It explores the role that sixteen different elements of emotional well-being play in one’s life, by applying the fifteen skills in this model together with happiness as an indicator of emotional and social well-being. How one uses skills such as assertiveness, empathy, impulse control and optimism significantly influences their communications and conflict resolution success. The TESI® (Team Emotional and Social Intelligence Survey®) is an internal 360 which measurers the team’s performance on seven team competencies including communications, conflict resolution and stress tolerance. Team members rate the team’s performance and then the aggregated results are presented to the team, with each individual’s scores remaining confidential. This allows team members to speak frankly with one another and quickly advances the discussion to building a successful action plan. Willingness to honestly review current behaviors and results is central to making meaningful change. Fortunately, we don’t need 100% willingness at the beginning. There needs to be agreement to participate, however the vigor with which the participant(s) engage usually expands over time. As they perceive the possibility that they don’t have to stay stuck in this uncomfortable pattern and gain a sense of safety and trust in the process, willingness to make change usually grows significantly. Before a person buys into making personal change, he/she must recognize that the current way isn’t working. They need to take ownership of their own behavior and how that contributes to the difficult situations. At first it seems much easier to blame someone else – “It’s my bosses fault” or “It’s my team member’s fault” or “My organization doesn’t give us enough resources or time to do it right.” There could well be some truth in any of these statements, but they are not the point of the individual’s power. We can only change ourselves. Yet, fortunately, our changed behavior often leads to different responses. If an individual who used to create difficult conversations instead responds with collaborative invitations to work together, they are likely to receive a different response, although it may take a few times before the change is trusted. Others, such as the team or organizational system likely contribute to the challenges. Often one person is treated as the Identified Problem yet it’s really a systemic issue. Frequently, the individual does contribute significantly to the difficulties occurring; however, they are very seldom alone in creating the difficulties. Thus in individual coaching we need to work with the individual to take full responsibility for their behaviors and to embrace learning to be more successful. Additionally, it is very useful when we also work with the team leader, the whole team or other key individuals to address how they are working together. Nevertheless, even if the others in the process won’t participate in recognizing and making changes, the coaching can be significantly beneficial for the individual. They will still gain skills that improve their engagement, are likely to enhance their productivity and reduce the negative feedback they receive. Sometimes these benefits play out more effectively in new situations rather than the on-going challenge area. The benefits of these behavior changes are certain to impact both their professional and personal lives as conflict shows up everywhere. As a part of the recognition, the participant(s) need to understand what their challenges are as they respond to conflict. Are they avoiding, aggressive, or unreliable in that they don’t follow-through? These can be challenges for anyone, however, the problem to the team and organization is multiplied when these are challenges are held by the team leader. Then many people suffer the consequences of their poor conflict management. This is the role up your sleeves and build new habits time. It involves are four components of understanding, commitment, practice and feedback. As the cognitive awareness is developed of what occurs when their responses are curt and perfunctory, and the participant(s) become curious about what else they could do, we are starting to build commitment, the inspirational part. This is quite important to supporting the determination needed to start practicing the new ways. Finally, feedback will help to in fine tuning their approach, learning the right nuancing and getting it right. Both introverts and feisty people may not want to respond to feedback. This reluctance comes from different reasons, but can have the same consequences of not building the new relationships needed. Thus part of the coaching we do focuses on how to work with feedback as they begin using their new skills. Key skills from the EQi that particularly influence conflict resolution skills are: impulse control, empathy, assertiveness, problem solving, flexibility and optimism. All 16 skills are influential because of the complexity of working with conflict, but these 6 are at the core of effective functioning with conflict. Let’s say that Jill has taken the EQi, which reports lower scores in impulse control and empathy. She talks over people, responds hastily, is highly judgmental and will tell her direct reports abruptly how they are failing, but seldom offers solutions or helps them make changes. She seldom recognizes their successes. You can imagine that it’s hard working on her team. She has come to us for coaching on how to improve her work with her direct reports because her performance review calls out these ineffective behaviors. First, we will help Jill understand the process of working with emotions as reflected in this graph that shows the circle of emotions. We would work with Jill to understand the consequences of her approaches, build her optimism that she can change and help her understand how valuable that change will be. Next we will work with her to articulate specifically how she is interacting with her direct reports. Together we will diagnose the trouble spots so new approaches can be identified and practiced. For example, if a direct report is speaking she needs to not rudely interrupt, but listen and then respond. Jill can create reasonable boundaries up front to let them know she only has five minutes before her next meeting if necessary, and then set a better time to fully deal with the matter. There are many specific and concrete skills that she can begin applying that can greatly change her success. 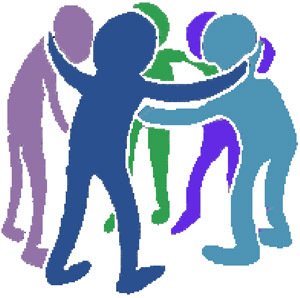 If Jill’s team is also involved we will have them take the TESI and work with them on how they are participating in resolving conflict, which will necessarily include other competencies, especially communications. Through this process we can build enhanced resourcefulness throughout the team. As everyone gets better at working through difficult issues, the team’s success will improve and Jill’s changes can be more effective and likely will be more appreciated. This is the follow through stage that requires diligence and has the most positive payoffs. It involves the components of commitment, practice and feedback. A key part of coaching is to help pace the process of change so that her work builds her success and isn’t so overwhelming that the changes aren’t practiced. In our example of Jill we will encourage her to practice some changes, get feedback and then fine tune her approach. As a few changes start working and become natural, we can work on new and perhaps more transformative changes. Deliberate steps and managing the magnitude of what she is asked to do will promote and anchor her success. Overall, investing in leader, staff and team improvements in working through difficult challenges can be quite effective. Building effective buy-in to the process from all parties greatly contributes to success. It is valuable to make a sufficient investment so that all four stages are implemented. Frequently encountered emotional intelligence (EI) pitfalls that limit relationships and productivity at work are numerous. Ordering people to just “get it done” could well be the top pitfall of all. Do you agree? Several pitfalls and better EI Options are listed below. Listen to our recent webinar on these pitfalls and then comment with your thoughts and additional pitfalls. Better EI Option: Use all your smarts in solving problems; that is both your IQ and your EQ. As we described in an earlier article, people can’t think without using their emotions. So the question becomes whether you and your team want to be aware of your emotional responses, including your intuitive awareness, and factor in all your data when resolving the problem. We suspect people seek to avoid their emotions when they are afraid they don’t have the skills to manage the emotions successfully. However, this strategy frequently backfires as the emotions will leak out in some poorly managed format. It’s better to get training and coaching and be fully in charge of your responses. Whether caused by blind spots, habits, or lack of awareness, failure to recognize how others experience the way we engage is a key contributor to leadership derailment. When we don’t notice that we lose people’s attention because we talk too long or we scare folks away by being too demanding, we miss vital information. Instead of recognizing the responses and making strategic changes the head this type of head in the sand leader keeps on keeping on right into a diminished career. So how can this be prevented? After all it is challenging to accurately discern how others are responding, and even harder to know what triggered particular responses from peers, direct reports or others. A client we’ll call Melinda found an answer. She kept her job and is much happier now thanks to her working carefully with her EQ 360 results. She heads a key program as senior vice president for a high profile non-profit. She managed a department in charge of launching new programs and convincing key investors to fund her organization’s programs. Her staff needed to be inspired and to receive detailed overviews on expectations and expected ways to engage in order to demonstrate the organizational mission. She did this well. However, when she reported up to the high profile board of community leaders, Melinda had lost so much credibility that the CEO thought he was going to have to let her go. The board wanted big picture, quick and strategic feedback yet Melinda was giving them long winded analytical analysis that bored most and angered some. Emotional Self-Awareness by recognizing that when she felt worried, she gave detailed explanations and further lost the Board. Assertiveness by fine tuning her listening skills so she could be more effective with her assertiveness. Melinda didn’t have any problem speaking up, but she too often wasn’t strategic in how she spoke. Optimism by recognizing that when she started her 360 work she was feeling defensive and less than sure that she could make the changes and that was aggravating her didactic habits. If she could trust in her many skills and tap into her flexibility, Melinda could make changes more effectively. The EQ 360 is an assessment in which an individual rates his or her own skills and others who know him or her in a variety of ways also answer the same questions. The results graphically show how the individual perceives his or her skills in each of the 16 EI skills measured by the EQi and then presents a comparison to how others see those same skills. The results are shown by the different rater groups of boss, direct reports, peers, family/friends or others, such as clients. The overall goal is to accurately understand one’s skills and how they are expressed and to have a similar perspective between the individual and the raters. However, it is quite likely that there will be differences, and it’s possible the differences will vary between rater groups. For example, the boss may be in agreement with the individual, the direct reports may rate him or her higher and the peers may have lower ratings in some areas. The raters’ responses are reported with three or more to a group, except for those of the boss. That confidentiality supports candor. The opportunity for everyone to be more reflective: The individual receives considerable data that invites introspection and reflective awareness. Raters are asked to take about twenty minutes to answer the questions and that causes them to shift from day to day tasks and think about how the individual engages and displays skills. Hopefully, the rater takes some time to reflect on what part of the engagement they are responsible for as well. It is a two way street! And finally if you have a leadership group each having their own 360 and then meeting to discuss what they have learned and opportunities, the invitation for deepening the reflective awareness is large. Light is shined on blind spots: This is probably the best recognized value of the 360 by organizations. We can easily move along in our lives thinking we’re doing fine while totally missing the mark with our direct reports, for example, and be incredibly wrong. Melinda found that not only did she have a problem with the Board but that she had taken so little time to engage with her peers that they didn’t know her well. This resulted in mediocre ratings from them. Coaching discussions helped her realize the value of working with her peers to herself and the organization. This reframed “I don’t have time for lunch with Jose” to “I can’t afford to miss lunch with Jose.” The blind spots can also be about behaviors. Melinda may think she has great stress tolerance skills, but family/friends might report they miss her and are worried about her health because she works so much. Direct reports might reflect she has low stress tolerance because they experience the anxiety that taking a new project on creates, and they are often given much of the work. The resulting resentment from staff brings on a handful of other challenges. Balancing skills to build congruence. This is one of the most important benefits of the EQ 360. The 16 skills reflect important information on their own, but no skill is an island. Every skill is more powerful when exercised in context of highly related EI skills. For example, the effectiveness of assertiveness is tied to skills in empathy, impulse control and optimism. For more information see Marcia’s article on The Four Corners of Empathic Assertiveness. Rater group congruence: If direct reports, peers, the boss and others have considerably different views of an individual’s performance, it’s a problem. Success in an organization is a multi-dimensional endeavor. The 360 points out problem areas and supports strategic focus in building relationships. Horizons are broadened when the leader takes time to look at feedback from people he or she works with regularly, consider the information carefully and prepare a focused response. The EQ 360 should always be used for the right purpose, which is for individual growth and it requires a trained coach who will help sort through the information and guide the person in their growth process. Most importantly, the individual needs to bring a willing attitude to the process. Willingness to learn and make a few strategic changes can result in phenomenal career benefits. It did for Melinda. She expanded her mindfulness, carefully prepared for Board meetings and practiced how to respond at the level they expected. She built relationships with her peers and found they had much to share and she enjoyed her work more because of the valuable relationships. Melinda’s boss expects her to be a vital part of the workforce for a very long time. Collaborative Intelligence™ For You and Your Team! Collaborative Intelligence™ is a powerful result experienced by leaders, teams and organizations when they invest in the ground work it takes to reach this pinnacle of success. Collaboration involves working with one or more people in order to achieve a resilient result. Intelligence is the ability to learn facts and skills and apply them well. Our book, The Emotionally Intelligent Team, sets forth the Collaborative Growth Team Model by identifying the seven core skills needed to understand and develop the behaviors of team success. 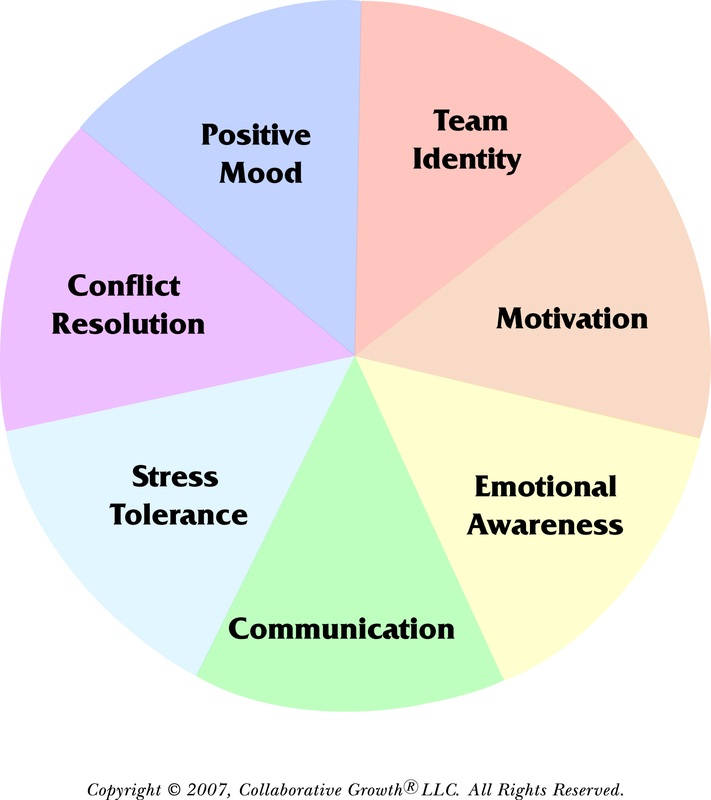 Those seven are team identity, motivation, emotional awareness, communication, stress tolerance, conflict resolution and positive mood. These seven skills are the dimensions of team emotional and social effectiveness (ESE). We define ESE as the ability to recognize and manage your own emotions and to recognize and respond effectively to those of others. It includes understanding your social community from the “big picture” point of view and the ability to direct change and to adapt to that change. When teams are doing well in applying many of these seven skills, they move to the middle level of operational success and experience the four highly desired results of empathy, trust, loyalty, and better decisions. A team that is highly engaged achieves the significant lasting benefits of sustainable productivity and emotional and social well-being. As your team moves through the dimensions of this model, the synergy of Collaborative Intelligence™ is fired up. Collaboration is a composite skill that emerges from the masterful use of ESE skills. The members of a football team collaborate when they huddle and agree that they will each do their part to execute a particular play. In the middle of the play, except in the face of an unexpected opportunity, the fullback won’t decide to change the play because he’d prefer to run the ball rather than block! Team loyalty is unquestioned. When your team collaborates, team members take time to explore alternative answers and find a solution that integrates the wisdom of the team. It takes more time up front, because the team invests in listening to one another, to thinking things through, and to coordinating responses with genuine respect for one another. Collaboration pays off big time as you and your team progress. Your self-discipline and collective intuition will make the future much easier to navigate because teams that coordinate their ESE skills naturally act with Collaborative Intelligence™ . This set of blended competencies is the birthplace of synergy. Teams tap into their shared memory and individual capacities to maximize their knowledge, problem-solving capabilities, and resilience. They respond with agility to the fluctuating emotional and social contexts of the team and the organizational dynamics. The correct blend of ESE skills is the rocket fuel that propels your team to achieve its full collaborative capacity. Your team exists in order to solve problems, to make decisions and get things done. When a team applies the seven ESE skills, your decisions are more long-lasting. This result occurs because the members communicate, have fun and engage in creative conflict sufficiently to test possible solutions and find the best answers. In fact, this result of better decisions is a natural consequence from the collaborative process that promotes the synergy of creative and tested decisions to occur. As this happens, we invite you and your team to notice that you are operating with Collaborative Intelligence™ . All materials have a copyright held by Collaborative Growth, LLC. A.R.R. Contact us for permission to quote, reprints or comments.